Proporta has announced that the Maya line will ship at the end of the month. A small cut out is provided for access to the charging port. Looking like 70’s sunglasses cases or something an ice cream bar would come in, (if ice cream bars came in leather cases) these handcrafted pouch-type cases come in a variety of colors. Meanwhile, Vaja is expanding on their case lines with four new offerings. 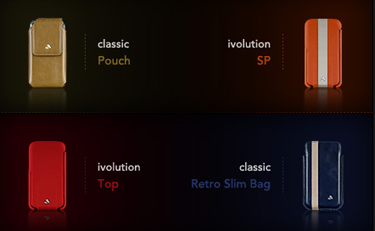 Coming to the Classic line is a Pouch and Retro Slim Bag, while the i-volution line has added a Top and SP model. More cases are on the way, but for now, these leather beauties look pretty happening. Case-mate has hit the mark with several new cases. The Signature Series is hand crafted and comes in Sienna Red or a classic Black. Free personalization is available and screen protection is included. A holster combo is also available with a belt clip. If you’re in the need for a hot pink crocodile embossed leather case, look no further. 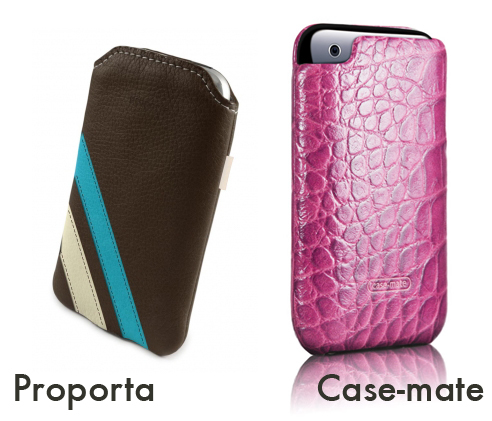 Case-mate has your new iPhone covered. If hot pink ain’t your style, there are other colors to choose from, including brown, black, green, grey and red. The top of the line model from Case-mate is the Carbon Fiber Case with rare leather that has previously been used in high-end aftermarket cars. Available in Silver or Black. Like all of the Case-mate cases the leather is wrapped around impact-resistant molded shell.